Born 3 Nov 1897; died 5 Jun 1984 at age 86. Instincts of the Herd in Peace And War, by Wilfred Trotter. - book suggestion. Born 3 Nov 1870; died 7 Jan 1965 at age 94. American chemist who was involved with commercial production of calcium carbide (discovered accidentally with his father on 2 May 1892). Calcium carbide is used to generate acetylene gas, important for welding, and is the basis for the syntheses of many organic chemicals and polymers. In 1897, he became a construction engineer for building calcium carbide manufacturing plants in the U.S. and abroad. He cofounded (1900), and was a major stockholder of, the Union Carbide Corporation. During 1899, he designed a gas analysis apparatus which became standard equipment in industrial laboratories. He published Analysis of Industrial Gases.(1900). He donated the Morehead Planetarium, the first at a U.S. university, which opened 10 May 1949 at the University of Chapel Hill, North Carolina.«. History of Industrial Gases, by Ebbe Almqvist. - book suggestion. Booklist for Union Carbide History. Born 3 Nov 1854; died 22 Jul 1922 at age 67. Japanese-American biochemist and industrialist who isolated the hormone produced in the adrenal gland that causes the body to respond to emergencies. This chemical was adrenalin (now called epinephrine) from the suprarenal gland (1901). This was the first pure hormone to be isolated from natural sources. He applied for and received a U.S. patent on the substance, and went on to make a fortune with his marketing of Adrenalin. In fact, the product that he marketed was not pure epinephrine, but a mixture of the hormone and its sibling compound, norepinephrine (or noradrenaline). It is now made synthetically. He also found takadastase, and played a key role in the introduction of phosphate fertilizer along with various other manufacturing and chemical industries. to Japan. Born 3 Nov 1749; died 15 Nov 1819 at age 70. Born 3 Nov 1718; died 30 Apr 1792 at age 73. Italian physician, born in Capri, Italy, who first recorded relationships between occupational environment and workers' illnesses and is considered a founder of occupational medicine. Educated in philosophy and medicine, he developed his interest in workers' health while a student. He introduced the diagnostic tool of asking a patient his occupation, and classified occupational health hazards accord to causes (noxious vapors, very fine particles, heat, cold, humidity, irregular physical motions, etc). He addressed issues of ventilation and recommended such protections as face masks. He compiled the first systematic treatise on occupational diseases, De Morbis Artificum Diatriba(1700). He taught at the University of Padua until his death in 1714. Died 3 Nov 1986 at age 74 (born 14 Jun 1912). English astronomer who was 10th astronomer royal of England (1933–55). His work was devoted to fundamental positional astronomy. While HM Astronomer at the Cape of Good Hope, he worked on proper motions and parallaxes. Later he showed that small residuals in the apparent motions of the planets are due to the irregular rotation of the earth. He led in the worldwide effort to determine the distance to the sun by triangulating the distance of the asteroid Eros when it passed near the earth in 1930-31. Spencer Jones also improved timekeeping and knowledge of the Earth's rotation. After WW II he supervised the move of the Royal Observatory to Herstmonceux, where it was renamed the Royal Greenwich Observatory. Died 3 Nov 1944 at age 79 (born 10 Apr 1865). Died 3 Nov 1939 at age 79 (born 14 Feb 1860). Pierre-Paul-Émile Roux was a French bacteriologist who began working with Louis Pasteur in 1878. He was noted for his work on diphtheria. In 1888, Roux and Alexandre Yersin isolated a soluble toxin from cultures of diphtheria. The bacterium itself, though only found in the throat, has destructive tissue and organ effects body wide, by producing, they hypothesized, the chemical toxin. They filtered diphtheria cultures to remove the bacteria and then used the remaining fluid filtrate into healthy animals. As expected the animals showed diphtheria lesions but without any obvious presence of bacteria thus demonstrating that a toxin is the active agent causing diphtheria. He became director of Pasteur Institute at Paris in 1904. Died 3 Nov 1896 at age 49 (born 12 Dec 1846). German chemist who discovered that the thyroid gland was rich in iodine, an element not known before that to occur naturally in animal tissue, making the thyroid gland unique in being the only tissue to contain iodine. This led to the discovery of the iodine-containing thyroid hormone and to its treatment in thyroid disorders. This, his most important discovery, he made in the last year of his life, 1896. In 1975, Queen Elizabeth II opened the North Sea pipeline, Firth of Forth. The first oil was piped ashore from the North Sea at Peterhead, Scotland. From BP's "Forties Field" the pipe runs 110 miles along the seabed and then 130 miles to the oil refinery at Grangemouth. The field was discovered by the drilling rig Sea Quest in October 1970. Now, oil from the Forties reservoir is produced through some 55 producing wells which deviate by up to 65° from the vertical and fan out to 3 kilometres from each of several platforms. In 1952, Clarence Birdseye marketed the first frozen peas in Chester, N.Y. While a U.S. field naturalist near the Arctic, he had learned the technique of flash freezing from Labrador Inuit. Freshly caught fish, when placed onto the Arctic ice in the frigid wind, froze solid almost immediately. In Sep 1922, he began a company, Birdseye Seafoods, Inc., to process chilled fish fillets at a plant near the Fulton Fish Market in New York City. On 3 Jul 1924, he organized the General Seafood Corporation, which began the frozen foods industry. Retail frozen foods began 6 Mar 1930, in Springfield, Massachusetts at the "Springfield Experiment Test Market" which offered 26 different vegetables, fruits, fish, and meats. In 1906, “SOS” was specified as the international distress signal, in a document signed by representatives of 27 nations at the second International Wireless Telegraph Convention in Berlin. It would replace the earlier Marconi call sign CQD. By 1904 many transatlantic British ships had wireless equipment. First used in England on landline wires, “CQ” preceded time signals and special notices as a sign for “all stations.” The Marconi company suggested adding the “D” meaning distress. The code “CQD” was established as a distress signal on 1 Feb 1904, but was never chosen from such a phrase as “Come Quick Danger.” The 1906 Conference proceedings do not detail the discussions about the choice of SOS. The likely reason is that it was speedy to tap out (not from “Save Our Souls”). In 1892, the first automatic telephone exchange, using the switching device invented by Almon B. Strowger, (born 1839) opened to the public in LaPorte, Indiana, with about seventy-five subscribers. A considerable amount of ceremony was attached to the affair, with a special train run from Chicago and a brass band on hand to greet the guests. This early system did not use a dial to enter the desired number. Instead, using three keys, one for each digit of a three-digit number, a subscriber pressed each key the appropriate number of times for each digit. The first dial phones (with projecting vanes instead of holes) was used in Milwaukee's City Hall (1896). * In the UK, the very first Strowger exchange opened at Epsom in Surrey in 1912. In 1863, the first U.S. yeast preparation patent was issued to J.T. Alden of Cincinnati, Ohio (No. 40,451), for "an improvement in the preparation of yeast" which reduced concentrated yeast from a plastic or semi-fluid state to a dry granular form, a convenient way of preservation for future use. His process was to press the live yeast concentrate through a fine wire mesh to produce threads of the substance of about 1/8-inch square. When laid on drying racks, moisture rapidly evaporated because of the high surface area, leaving the dried yeast in a finely-divided state. The granular form avoided the grinding and crushing needed with using cake form dried yeast, which mechanically damaged the yeast cells, reducing the active yield. 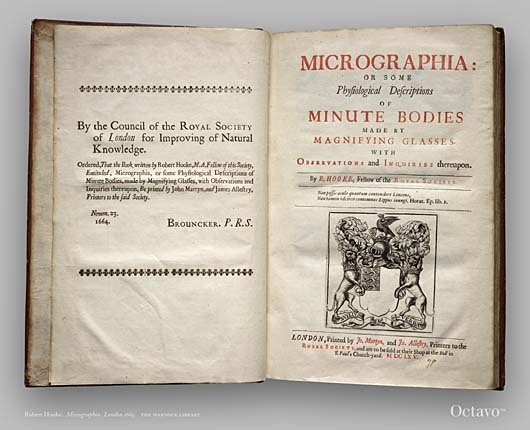 In 1664, Robert Hooke showed an advanced copy of his classic bookMicrographia, or some Physiological Descriptions of minute bodies made by magnifying glasses with observations and inquiries thereupon to the Royal Society in London. This large volume contained sketches of practically everything Hooke could view with the latest invention of the day, the microscope. It was also history's first treatise on microbiology, and coined the word "cell" in the biological context. Also included in this volume are many snow crystal drawings, which for the first time revealed the complexity and intricate symmetry of snow crystal structure. The book was published in 1665 and became promptly a best-seller.